Rarely available this 2 bedroom, 2 bath very private end unit. The small area off the kitchen with its own balcony allows one to have an office, extra sleeper couch or built in murphy bed. Wood floors in kitchen, living room , dining room combination. Updated master bath with marble tile floor and updated shower enclosure. There are 2 balconies that allow for wonderful views of Sarasota Bay and relaxing Fairway bay greenery. This third level condo has a very relaxing ambiance. A must see for the fussy buyer. 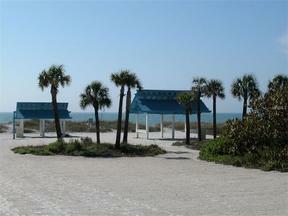 Bay Isle beach club is available to all who live at Fairway Bay. One can have the best of both world, Bay and Beach. Some furniture available.